Monin (our dear friend, moto driver, translator and general fixer; you can read his story in my book) takes us to his new house, out toward Russey Keo, through the dusty, gritty streets of suburban Phnom Penh. He turns left, away from the river, down a crowded narrow street buzzing with horse-drawn carts and motos and markets and a general swarm of people. We cross a little bridge over a swampy area and he turns left again, down a dirt path between homes stuffed against and atop each other. And there it is: Monin’s plot, no more than 25 feet by 25 feet, with a brand new concrete and wooden house covering nearly the whole area. It’s his dream, and it means his family can live together now. 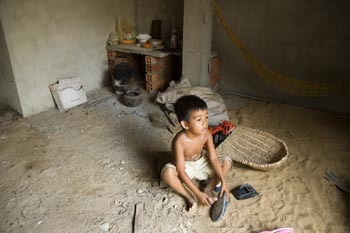 For years Monin and his wife, Yoon, rented a room too small for their young son and daughter, so the kids lived with their relatives in the countryside. 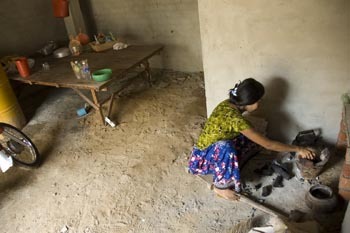 It’s what many Khmer parents do when they can’t afford a better house in the city, but the city is the only place to find work. But now: There is this home, after years of hard work, four hefty loans and all their life savings. Neighbors nestle here, all snug together, except there is nothing really cozy about the Khmer communal life. It’s hot, so hot, all the time; and the noises and smells of everyone around penetrate each and every house through the gaps between floorboards and tiny holes in the metal rooftops. Monin’s living quarters are high on a wooden ladder. The ground floor is dirt and the walls are concrete. In the back corner is a small bathroom, and just outside it is a tiny cooking alcove with a charcoal grill, a small counter set atop a stack of bricks and a wok hanging from the concrete post. That’s it: Monin’s kitchen. Yoon returns from the market and we meet their 4-year-old son, Sunny, whose left cheek bears the scar of a horse bite he suffered five months ago. Trailing behind Sunny are several little boys, then several more. Monin says his house always attracts the neighborhood kids. There are nine living within the three nearest households, and many more beyond that. We climb the wobbly ladder upstairs. It’s one simple room with a high metal roof and birds flitting about. Monin says they’re good luck — when he lived in the rental house, no birds came. But here they do. “We don’t ask the birds to come live with us. They just come on their own.” It must be good. The one-room living area has a hammock, a Sony TV (bought on the street for $50), a bottle of Khmer herbal medicine, a heap of clothes, an altar with dried lotus flowers, a few posters and postcards on the walls, and that’s about it. Monin works all night, seven nights a week, as a guard for a private home. Then he works most the day, seven days a week, driving tourists around town. His wife works all week at the national library. They work all these hours to pay for all the expenses of owning a home — and still, they barely scrape by.